That proposal, dubbed the “Terms of Credit Act,” bore the imprimatur of the Republican Study Committee and appeared to be an ideal conservative starting point for demanding concessions as a condition of extending the nation’s borrowing authority — before Republicans would ultimately have to swallow a “clean” bill. However, a whip count Wednesday night showed the RSC measure didn’t have the GOP votes to proceed. Sources familiar with discussions said conservatives could sniff out a “show vote” when they saw one, and said they would only support a debt ceiling bill that carved out policy riders that could legitimately put Democrats in a jam. A leadership ally, Rep. Tom Cole, R-Okla., spoke to another concern about the RSC bill: He told reporters Thursday afternoon he was troubled that such a complex piece of legislation was being routed through the legislative pipeline without so much as a hearing at the committee level. The RSC introduced the bill Monday amid the “will-he-or-won’t-he” intrigue of Ways and Means Chairman Paul D. Ryan’s potential bid for speaker. The RSC debt limit proposal, the only one formally introduced so far, has been shelved. The center-right Tuesday Group is mulling its own ideas for how to raise the debt ceiling but hasn’t produced anything official. The deadline for Boehner to sort this mess out for his successor is approaching fast, He’s expected to leave Washington on October 30; Congress needs to raise the debt limit by November 3. And it’s not just the debt ceiling. Another bill that funds federal highways needs to be passed as well. CBS News reported that conservatives were already planning to challenge the speaker if he decided to raise the debt limit without provisions that made more cuts to government spending. In an interview on "Face the Nation" after his resignation announcement, Boehner indicated that his impending departure might give him more leeway to act in his final weeks in the Capitol. "I expect that I might have a little more cooperation from some around town to try to get as much finished as possible. I don't want to leave my successor a dirty barn. So I want to clean the barn up a little bit before the next person gets there," he said. Sarah Binder, a congressional expert at the Brookings Institution, said that if Boehner does, in fact, feel free from the pressures of the far right of his party, "one would think he would use it in order to try to move a debt limit" bill. "Defaulting on the government's debt, despite all the politics...does seem to be an outcome that's too extreme, and that both [Senate Majority Leader Mitch] McConnell and Boehner would recognize," she added. One option under consideration is a big deal, one that wraps the debt limit increase into a package with spending cuts, highway funding and a long-term spending bill. But with few working days in Washington between now and Nov. 5, there may not be enough time. Reaching a deal with Democrats would infuriate conservative GOP lawmakers who prefer a fight, but it shows the speaker no longer feels beholden to the party's hard-right flank, which forced his early retirement. Treasury Secretary Jacob J. Lew has warned Congress not to wait until the deadline to act. As the debt limit was reached earlier this year, the Treasury Department suspended the issuance of some securities, and has instead been juggling its accounts with “extraordinary measures” to finance the government on a temporary basis and pay the bills. By November, though, the money is expected to run out, risking a federal default on already accrued obligations. So, here we go again. 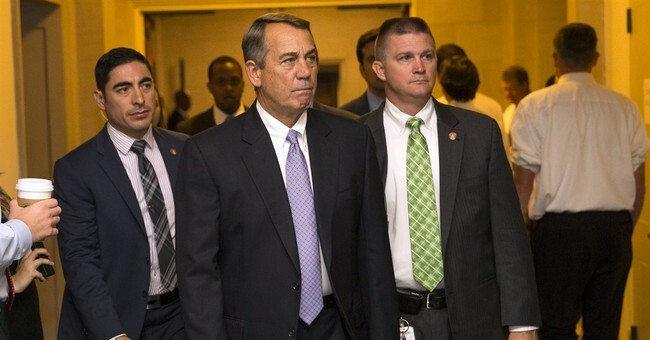 With Boehner and McConnell adverse to letting the country default, we shouldn't be shocked if Boehner decides to raise the limit–clean–just as he pushes those revolving doors before his return trip to Ohio.